If you're seeking a versatile dress with sleeves that may be used for church, for the office or for a dinner date, then Shabby Apple is worth a visit. Many of the company's dresses are cut a little above the knee, but if you select "view all" in the menu and scroll down, you'll see that some of the dresses do cover the knee cap. 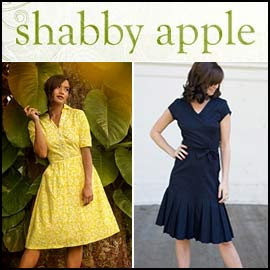 Shabby Apple has some truly interesting dress styles, presented in categories such as "vintage" and "boutique." There's also a nice selection of stylish maternity dresses, and the sale section had some very attractive dresses at the time of our visit to the site. Do a search on the site for "prints" and you'll find a section containing many dresses with interesting printed patterns: a giraffe spot pattern, flowers, stripes and "cotton candy."